For years when people chose to install tile flooring in their Indianapolis home, ceramic was the go-to choice. Ceramic tile is practical, versatile and durable. It is easy to maintain and comes in a fairly wide variety of design choices. Let's learn more about the gold standard of tile flooring: Ceramic Tile. Ceramic tile flooring comes in glazed or unglazed options. Glazed tiles have a protective coating that can also include coloring. Regardless of which you choose, you should have the floor sealed so that both the tile and grout have a protective layer over them. Ceramic tile cannot be installed in every room - it is a heavy floor that requires a certain type of sub-floor. If you are considering ceramic tile, have your home professionally measured and estimated to make sure ceramic flooring will work. Learn more about ceramic tile flooring from Indianapolis tile store Kermans. Water resistant: When properly sealed, ceramic tile is practically water and stain proof. It is also naturally resistant to high humidity. These qualities make ceramic tile ideal for use in moist environments such as bathrooms or kitchens. Durable: Ceramic tile has a very high hardness factor and will typically last for well over a decade. If a tile does crack, it can often be replaced which further extends the life of your floor. Easy to clean: Wipe up spills. Sweep and mop the floor regularly to remove dirt and debris that can wear your tile down over time. No need for special cleaning products or treatments. Great for homes with allergies: Hard surface flooring is perfect for people with allergies as it doesn't attract dust, mold or mildew. Beautiful range of designs: Ceramic tiles come in a wide range of colors and can even be cut into different shapes for a creative flooring installation. Affordable: Ceramic tile is one of the most affordable floors available today. Our Indianapolis tile flooring store is located on the northside of Indianapolis in the Castleton area. Stop by and ask to see our ceramic tile options - be prepared to stay for a while! 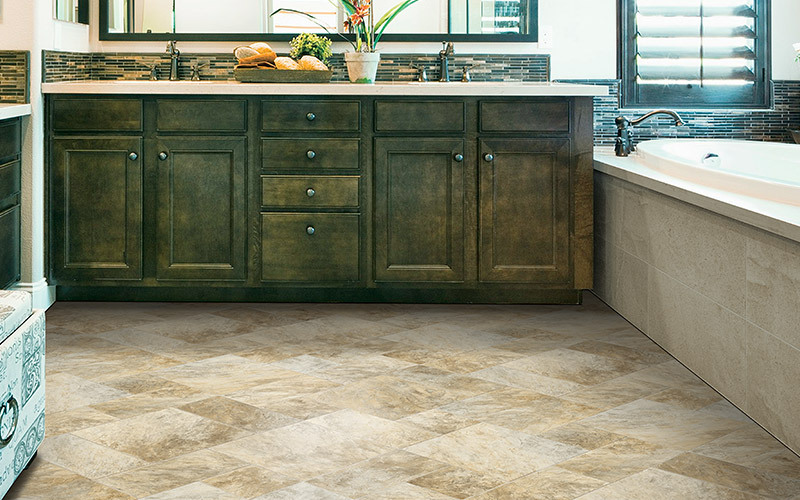 We have lots of beautiful ceramic tile, expert installation and free design assistance to help you find the best floor for your lifestyle and budget.